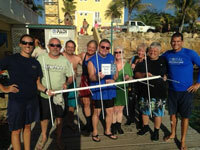 Coral Restoration Foundation Bonaire Launches “Adopt a Coral Program” | Dive Industry Association, Inc.
Bonaire, Dutch Caribbean (March 31, 2015) The Coral Restoration Foundation (CRF) is proud to announce the launch of the first ‘Adopt a Coral’ program (AAC) on Bonaire. 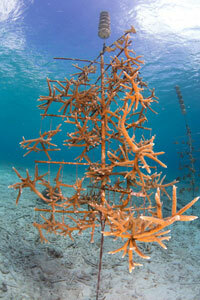 The AAC program is designed to raise awareness about the financial funding needed to raise a full grown coral nursery tree. Orca Scuba Center, from Wenatchee (USA) has donated the first US$ 500 to adopt an entire coral tree and thereby giving more than 100 corals the opportunity to grow every year in Bonaire. The Coral Restoration Foundation Bonaire hopes that more companies like Orca Scuba Center will follow and contribute to the restoration program. The CRF Bonaire project started as an idea by Buddy Dive Resort Bonaire and the Coral Restoration Foundation USA to achieve the main and most important objective: preserve and restore the reefs on Bonaire. Today the CRF Bonaire has transplanted almost 4000 corals to five different restoration sites on the island and has reached a total nursery capacity of more than 7000 corals. The CRF Bonaire strongly believes that community involvement is the key to the overall success of the project.